The scientifically romantic poetry of Paul Kosir has its academic roots in his nine years as an undergraduate at the UW-Madison and his Master’s in Environmental Education from UW-Stevens Point. His experiential nature poetry was drawn from his twelve years as the Naturalist at Wyalusing State park near Prairie du Chien. Kosir won 3rd place in the 2012 Wisconsin Writers Association Jade Ring Contest for The Northern Lights and the next year had four poems published in the anthology A Wisconsin Harvest Vol. II. In 2019, Earth was published in the nature poetry journal The Avocet. Kosir has taught environmental science, biology, and physical science at the high school level; and earth science, biology, and environmental issues at the college level. Born in Milwaukee, he now lives in La Crosse with his wife and their two sons. Paul enjoys birdwatching, hiking, learning and writing about nature, gardening, and working on the family’s 13 acres near Hillsboro, Wisconsin. 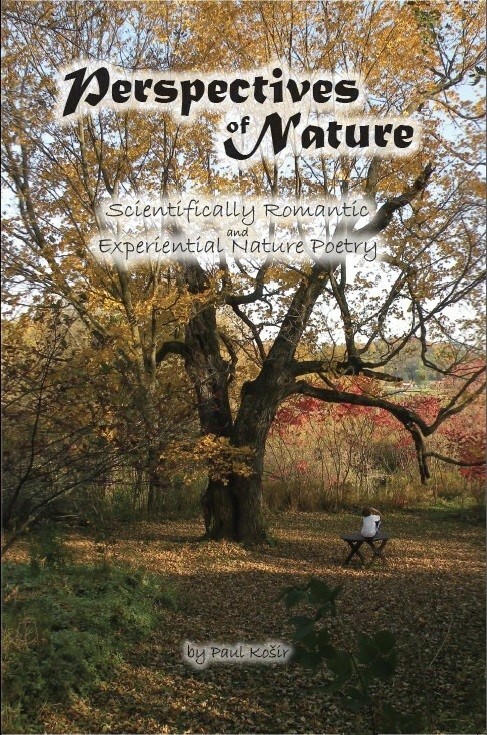 Perspectives of Nature: Scientifically Romantic and Experiential Nature Poetry (2017). Available for $9.95 from Amazon and Barnes and Noble. no sight, no sound, no touch, no taste; my sentience does not stay. till blackness strikes my eyes so deep, there’s nothing where I lay. the chamber walls are silent, in their stillness I am blest. while sheltered here, I fail to feel my limbs that once were stressed. the only taste is bitterness of food from my last hour. for scent is barely issued from these walls severe and dour. The vault that holds my earthly self is not for me a grave. Immobile, not inanimate, I’m willing, not a slave. my corporeal self, serene, now bonded, leaves the cave. handwritten there in bright calligraphy. aglow with rare Aurora Boreal.